↑ Always lying in wait for the neighboring nations, strong in arms and persuasive in council, he acquired Mesopotamia, Armenia, 'Seleucid' Cappadocia, Persis, Parthia, Bactria, Arabia, Tapouria, Sogdia, Arachosia, Hyrcania, and other adjacent peoples that had been subdued by Alexander, as far as the river Indus, so that the boundaries of his empire were the most extensive in Asia after that of Alexander. The whole region from Phrygia to the Indus was subject to Seleucus. He crossed the Indus and waged war with Sandrocottus [Maurya], king of the Indians, who dwelt on the banks of that stream, until they came to an understanding with each other and contracted a marriage relationship. Some of these exploits were performed before the death of Antigonus and some afterward. ↑ The Indian Encyclopaedia by Subodh Kapoor (2002). Cosmo Publications. Page 1372. আইএসবিএন ৯৭৮-৮১-৭৭৫৫-২৫৭-৭. Retrieved 14 April 2012. ↑ Vincent A. Smith (1998). Ashoka. Asian Educational Services. আইএসবিএন ৮১-২০৬-১৩০৩-১. ↑ ক খ Ramesh Chandra Majumdar; Ancient India. Motilal Banarsidass Publ. 1977. আইএসবিএন ৮১-২০৮-০৪৩৬-৮. ↑ Partha Sarathi Bose (2003). Alexander the Great's Art of Strategy. Gotham Books. আইএসবিএন ১-৫৯২৪০-০৫৩-১. ↑ Radhakumud Mookerji (1988). 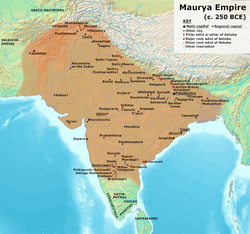 Chandragupta Maurya and His Times. Motilal Banarsidass Publ. আইএসবিএন ৮১-২০৮-০৪০৫-৮.